17th of August was a day to remember for The Music Suite! We were honoured to have violinist Alan Choo give a masterclass to 6 of our very own students. The masterclass started at 3pm and lasted a full 3 hours as the students took to the stage one after another. Alan and teacher Jeremiah started the masterclass off with a violin duo by Jean-Marie Leclair, setting the mood for what would turn out to be 3 hours of fun, learning, laughter and even some tears! 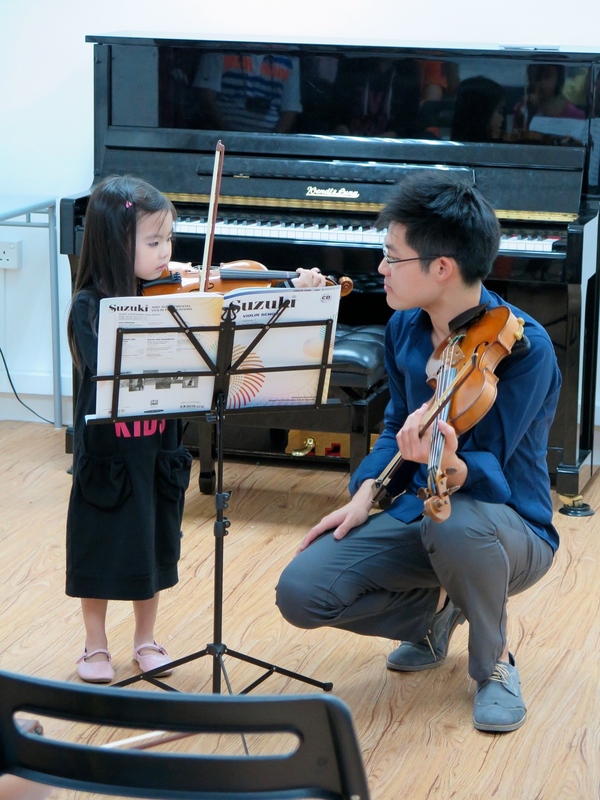 The students and parents were entertained by Alan as he taught the kids creatively through stories and demonstrations on his own violin. We were proud of all of our students as they went up to play for Alan fearlessly! The age of the students today ranged from 4 to 11 years old. This also meant the Alan often found himself bending down, sitting on the floor, and even kneeling on the floor in all sorts of weird positions for our young students! Sorry Alan! We are so thankful to have had violinist Alan Choo teach our students today and would like to apologize again for his bruised knees! We hope to see more of Alan in the near future and wish him all the best as he leaves for the United States next week!